For our next instalment of #Top100Shirts, we’re travelling around 10 shirts from 9 countries. One of my favourite things about this list is the diversity of it. 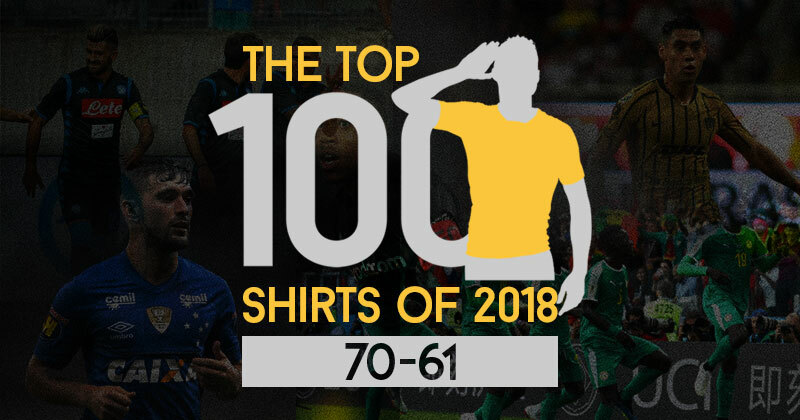 If I was to come up with my own personal Top 100, we’d have a list with many of the same sorts of shirts. But thanks to the beauty of collaboration we have something for everyone and to be honest some shirts which I wouldn’t have near a Top 500, let alone a Top 100. There’s plenty of pedigree in this next 10, with arguably the all-time best club for shirts and the world champions. As always I love hearing what you think of the countdown, so head over to Twitter and let me know. Can’t say this kit really does it for me. Looks like a graph you pretend you can understand but really have no idea how to read. I will admit it is nice but can’t say it’s up there for me. 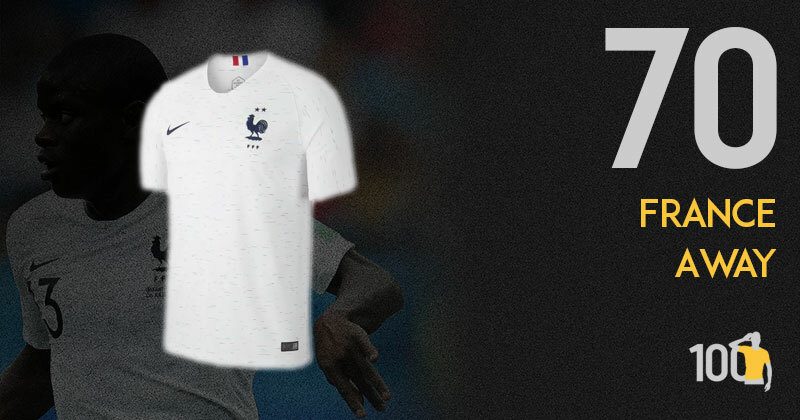 With France winning this years World Cup, it will be another French kit that hangs around for quite a while. I absolutely adore this shirt. Not only does it remind me of a Jack Wills shirt that I own, but also it manages to combine the colours of the tricolour flag as well, something that I love on national team kits. Subtle, but effective. Wish they would have won the final in this shirt to truly immortalise it. 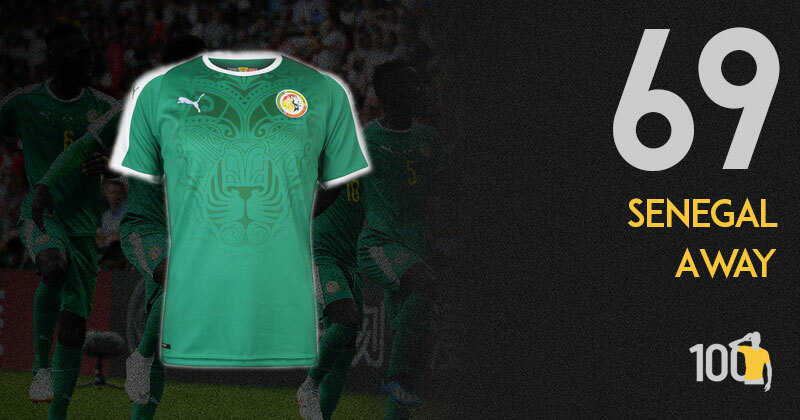 A well used template finished with typical Puma-style individuality makes a nice away kit for Senegal. A deep shade of green with white trim on collar and sleeves, the shirt is brought to life by a stylised lion pattern shadowed on the body. The badge brings just a dash of colour and brings it all to life. 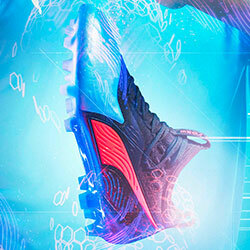 A good effort by Puma. adidas’ zig zag gradient template from the late 80s (think Portugal at Mexico ‘86) was brought back to life last year with Russia’s home shirt for the Confederations Cup, and whilst I assumed that would be the last we saw of it, it’s made a welcome return this year with a select group of teams. 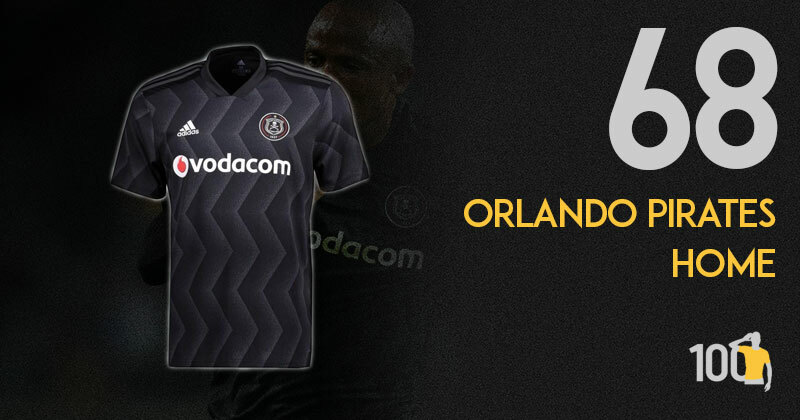 Orlando Pirates are one of the beneficiaries, and the pattern jumps out particularly well in black. It’s perhaps not quite as spectacular as their home shirt last season, but it remains as a worthy addition on this countdown. Man I love the pattern of this shirt. A rework of a late 80s classic pattern, the fading vertical zig-zags work so well. It is a template that was used by Russia in 2017 but in black and grey it is even more effective. 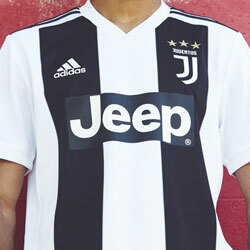 The grey stripes on the shoulder and the pirate badge give this kit a real intimidating feel, and for once the Vodafone sponsor actually works quite well. An excellent retro-inspired kit that the Johannesburg giants can be proud of. An iconic Samp shirt. 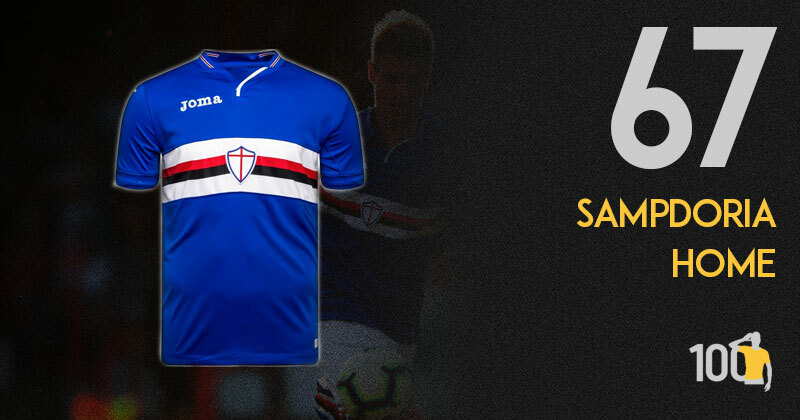 Everything about it looks great, both the lovely collar design, and that stripe in the middle combining the classic Sampdoria colours. Glad to see the club hasn’t changed too much about this one, and you can almost imagine Mancini sprinting along wearing it. As the shirt says itself, it really is “la maglia più bella del mondo” (the most beautiful jersey in the world). Is there a more iconic and stylish home kit in the whole of world football? I don’t think I have seen one. 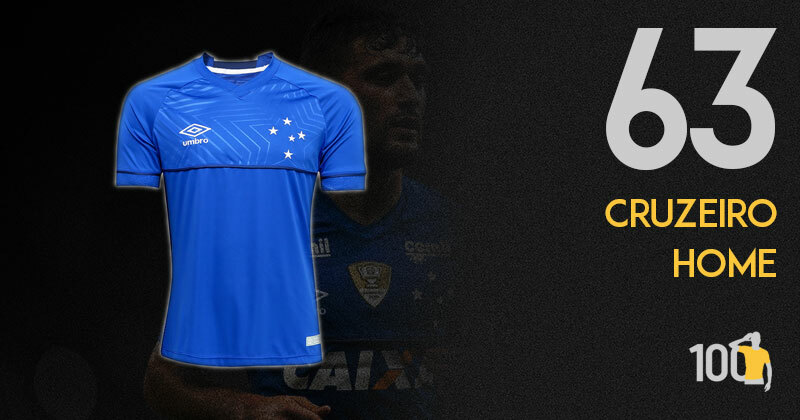 And Joma have done an excellent job in producing a shirt that is absolutely in keeping with the traditions of the club. A traditional blue with the red, white and black horizontal band across the chest featuring the stemma San Giorgio crest in the middle. The shirt only loses points due to the omission of Baciccia the club’s famous badge, featuring a pipe-smoking sailor, from its usual position on the sleeve. Still a lovely rendition of one of the best kits in the world. German clubs have a reputation for donning dark, bland and industrial looking strips that serve their purpose and nothing more, a microcosm of the country as a whole one could perhaps jest. 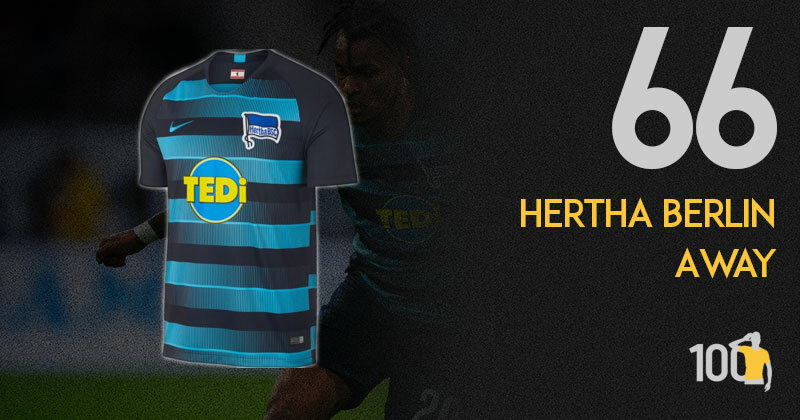 But that isn’t to say that unique or artistic kits don’t surface every once in a while and so step forth Hertha Berlin. This is another shirt that employs a delicate fading design with colours that compliment each other tremendously - that turquoise shade of blue is a real thing of beauty. Throw in a sponsor which, unusually for a German side, matches the design and colour scheme well and you’ve got one of 2018’s finest shirts. 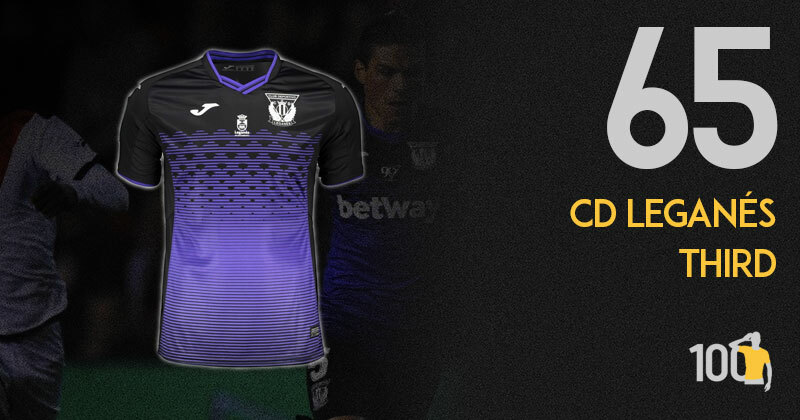 Not only have Leganes got a fantastic away shirt but they also have a belter of a third shirt. The shirt has been designed using the colours of a Spanish campaign against gender violence and includes the campaign’s hashtag on the back of the neck. 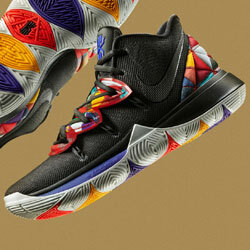 The design is certainly eye-catching. Gradient designs seem to be popular this year and Leganes have one of the better ones. All the badges and sponsors are in white which really contrasts well the darker colours. All in all, another great effort by Joma. The Madrid-based team’s 2nd, and thoroughly deserved, appearance on our top 100 here, with another beautiful effort from Joma. The thin stripes interspersed by black triangles that get smaller and smaller until the shirt becomes a purple block is a really individual and inspired design choice. The design also gives the shirt a definite royal feel, mimicking the Spanish capital’s famous regal history. N.B Purple is a colour that definitely needs to appear on way more strips. Like Sampdoria (a few places below in this kit ranking) UNAM have a unique badge and kit history. 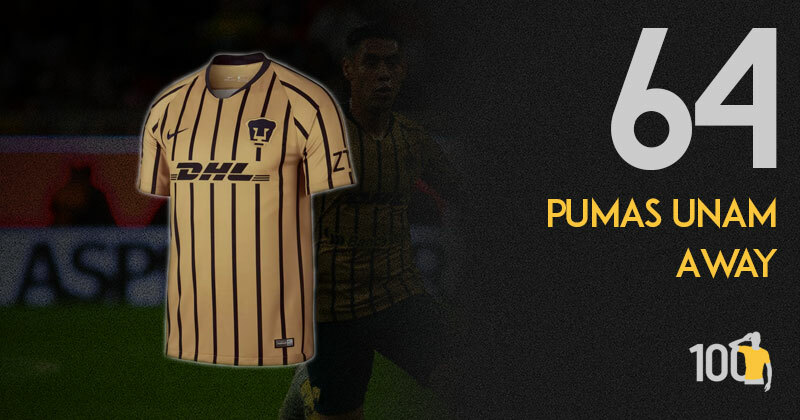 So it is a little bit of a surprise that their 2018 away kit doesn’t feature the giant puma on the body of the shirt as so many renditions of their home and away kit have done. However, it is a very pleasant surprise as what Nike have produced is an exceptionally beautiful shirt. Gold with thick dark blue pinstripes. They have managed to incorporate the sponsor in such a way that it fades nicely into the background. This is a lovely kit. Looks a bit like a vintage milkman shirt but instead of delivering milk anyone wearing these has a good chance of delivering you top corner bangers. UNAM have had some great kits over the years and although this is quite nice, I can’t say it’s up there with the best. Still delightful though. 2018 has been a hugely transformational year for Umbro and I’m all about it. Umbro have really done some research and the results show that they got it right. A banging star pattern fills the upper chest while all sponsors have a classy looking spot. Can’t not mention my love for the Umbro sleeve ends. They get me everytime. Now here’s a great away shirt. The dark navy is a great primary colour, and Macron picked the perfect shade of blue to compliment it. The badge with the subtle eagle behind it looks classy, and the sleeves with the blue pattern match perfectly. Macron are starting to become one of my favourite shirt manufacturers. 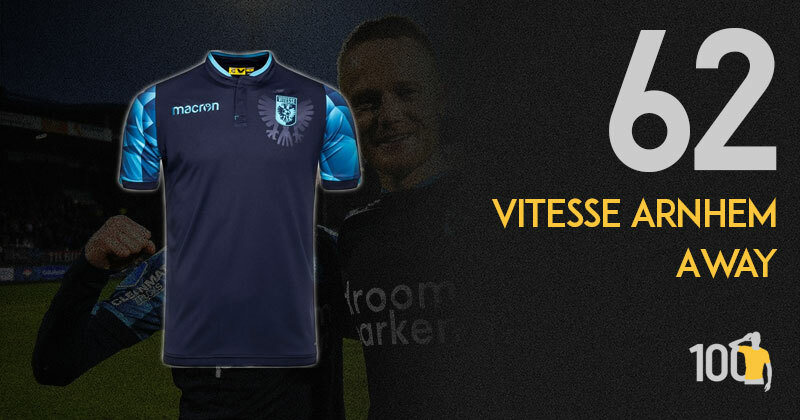 This year they have designed some amazing shirts and this Vitesse Arnhem away shirt is no exception. This is a smart looking shirt that uses dark blue and neon blue to great effect. The sleeves are what catch my attention. The club say that the shirt pays homage to the club mascot, Hertog who is a bald eagle. The sleeves are a stylistic depiction of Hertog’s wings, symbolising strength and fighting spirit. Personally, I can’t see those wings. I just see really nice looking sleeves. Wow, it’s a bit busy. A bit like a five-year old’s tried to cram absolutely everything they’ve done into a single “what did you do over the holiday” drawing. Consequently it is a bit muddled. I love both the colour and pattern of the main body of the shirt and the shoulder trim. If they had have stuck to the sky-blue trim for the collar and ditched the black kappa logos down the ribs it might have worked better. 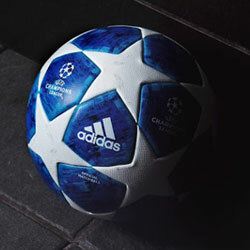 However, I do have immense sympathy for the designers: what can you do with those awful sponsor logos, eh? 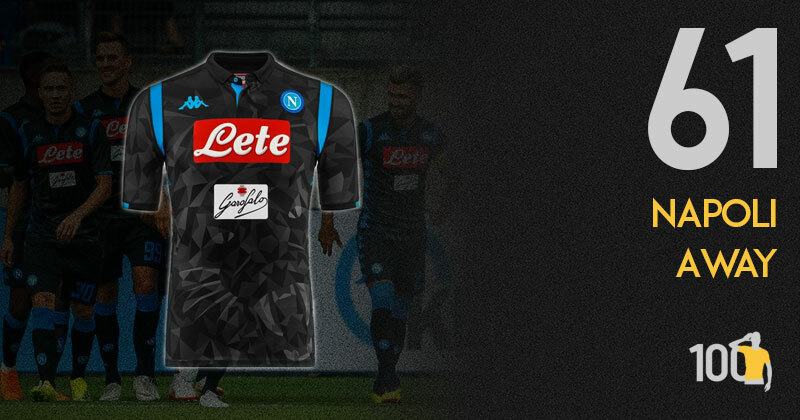 Whilst it’s the same pattern as the Third shirt, it works much better with the black and darker grey design. It helps it to look more textured and slightly more mysterious. However, I still find the blue stripes down on the shoulders out of place and they stand out in a negative way. 10 more down, 60 left. What’s been your favourite shirt revealed so far? 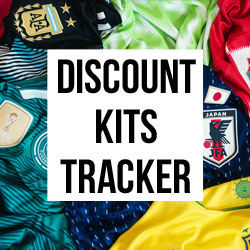 Let me know on Twitter, and if you want to compare prices on football shirts from a huge array of teams, FOOTY.COM is the place. Top 100 Shirts continues with a particularly strong presence from adidas in the next 10. These next 10 shirts could in many ways tell the story of football kits in 2018.